To have finer control over how one video clip flows into the next, you can use the Precision Editor. The Precision Editor is an editing tool that allows you to modify the point at which one clip transitions into the next, trimming or extending frames at the end of one clip and at the beginning of the next clip in the same magnified view. In the Precision Editor, you can see both clips on either side of a transition, and you can see and work with the unused frames from both clips. As you make changes, you can instantly watch to see how your edits affect the transition from one clip to the next. The Precision Editor also lets you reposition and trim other project elements, including transitions you’ve added between clips, audio and sound effects, titles, chapter and comment markers, cutaways, picture-in-picture clips, side-by-side (split screen) clips, and green-screen and blue-screen clips, all in the same magnified view. In the Project browser, move the pointer over a clip, and then choose Precision Editor from the blue Action pop-up menu (looks like a gear) that appears. 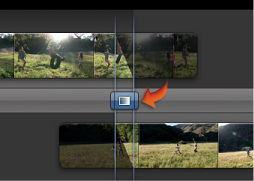 Or, double-click the gap between two clips with no transition between them. The Precision Editor opens. In the bottom portion, it shows the clip you started from (A, below), and in the top portion it shows the clip before it (B, below). Or it shows the clips on either side of the gap you clicked. The transition point between the two clips is represented by a vertical blue line (C, below). The non-shaded frames on either side of the line are the video that plays before and after the transition point (A and B, below). The shaded frames are video that you didn’t use in your project (D, below). Change the frame before the transition point: Move your pointer over the clip in the top portion of the Precision Editor, on either side of the vertical blue line. The viewer plays the video as your pointer moves. Click when you see the frame where you want the transition to start. The clip in the Precision Editor shifts so that the frame you clicked is at the “cut point” where one clip ends and the next begins. This action either extends or shortens the clip, depending on where you set the new cut point. You can also drag the clip, stopping when the viewer shows the frame you want at the cut point. Change the frame after the transition point: Move your pointer over the clip in the bottom portion of the Precision Editor, on either side of the vertical blue line. The viewer plays the video as your pointer moves. Click when you see the frame you want after the transition. The clip in the Precision Editor shifts so that the frame you clicked is at the “cut point” where one clip ends and the next begins. This action either extends or shortens the clip, depending on where you set the new cut point. Reposition the transition point between the two clips: Drag the transition point handle (the blue dot on the vertical blue line) to the left or right. This action trims frames from a clip on one side of the transition while extending the clip on the other side. The total duration of your project stays the same. As you reposition a transition point, the viewer shows the endpoint of the clip before the transition. To make the viewer show the startpoint of the clip following the transition instead, hold down the Option key as you drag the transition point handle. To preview your work at any time, move the pointer over the horizontal gray divider between the upper and lower clips. The playhead (the red vertical line) should be to the left of the blue transition line. Skim the transition by moving the pointer along the divider; play it by pressing the Space bar. Press the Space bar again to stop playing it. You can also skim any element in the Precision Editor, such as the unused portion of a clip, by moving the pointer over it. Click Done in the upper-right corner of the Precision Editor. Editing or repositioning a transition trims frames from one clip while extending the other. In the Project browser, move the pointer over a transition icon, and then choose Precision Editor from the Action pop-up menu (looks like a gear) that appears below it. The Precision Editor opens. The top portion shows the clip before the transition, and the bottom portion shows the clip after it. The transition itself, represented by a horizontal blue bar, appears between the two vertical blue lines. Extend or shorten the transition: Position your pointer over either end of the horizontal blue bar, shown below, and drag right or left. If you can’t extend a transition, it means there aren’t any unused video frames available on the end of the clip you’re working with. Reposition the transition without changing its length: Position the pointer over the blue bar until it turns into a hand, and then drag right or left. You can also simply drag the video clip before or after the transition to change where it starts and ends. To preview your work at any time, move the pointer over the horizontal gray divider between the upper and lower clips. The playhead (the red vertical line) should be to the left of the transition. With the Precision Editor open, click the Extras button at the top. Colored bars appear above and below the clips to represent the sound effects, titles, chapter and comment markers, cutaways, picture-in-picture clips, and blue- and green-screen clips you’ve added to your project. Drag any element from the center to reposition it, or drag either end to shorten or lengthen it (you can’t change the length of some elements). You can also use the Precision Editor to extend the audio from one clip so that it overlaps the next clip.